ATTEMPTS are being made by companies that include Microsoft and its lobbyists to legalise software patents in Europe, without a democracy even. Digital Majority has found a couple of reports from South Africa; this first one talks about plans to introduce the Community patent, which is merely a back door that would harm the Free software community (so the word community in “Community patent” is actually a malicious reversal). By protecting the intellectual property rights of inventors and innovators, patents promote innovation and creativity, the lifeblood of Europe’s ability to change with the times and remain competitive. Given the huge importance of patents and the challenges in managing patent rights across an increasingly borderless Europe, it is no surprise that member states are working towards creating an EU-wide patenting system known as the Community Patent. The article was seemingly written and published by a pro-patents guy, who apparently makes a living out of it. There is also this second new article from the same publication, regarding software patents specifically. Particularly in the US and Europe, various parties are lobbying for various amendments to the legislation. Some want the scrapping of the relevant restrictive sections in the legislation so that all kinds of business methods and computer software will always be patentable as long as they are new and inventive. Over in Germany, where protests have just taken place, some firm or umbrella called BIKT claims that software patents may be unconstitutional. The discussion of the various aspects of copyrights, patent law and other intellectual property rights are of special significance for the BIKT. The association has published on its internet site a statement related to the current appeal proceedings at the European Patent Office (EPO) regarding the issue of patentability of computer programs and takes a clear stand against the granting of software-related patents. The BIKT statement was prepared by the lawyer Rasmus Keller from Viersen and is based on his legal study which was published recently. He presents clear arguments explaining that the granting of software-related patents represents an encroachment on the exploitation rights of software developers which cannot be reconciled with constitutional law. As a consequence, the granting of such patents is categorically impermissible. The Court of Appeal decision also supported the 4-step test for patentable subject matter set out in the Aerotel/Macrossan decision, but cautioned against applying such tests blindly. The practice notice, issued in December 2008, indicates that the UKIPO will continue to apply the Aeroel/Macrossan test in deciding whether computer-related inventions are excluded from patentability. Observers question whether this will really constitute any shift in UK patent law as one would expect following a decision as significant as Symbian. However, the practice notice goes on to suggest that there will be some change in the way in which the UKIPO assesses software implemented inventions in future. In particular, the practice notice states that an important factor is “what the program does as a matter of practical reality” and provides an example in which ‘improving the operation of a computer by solving a problem arising from the way the computer was programmed – for example, a tendency to crash due to conflicting library program calls – can also be regarded as solving “a technical problem within the computer” if it leads to a more reliable computer’. 1. The claim category of a computer-implemented method is distinguished from that of a computer program. Even though a method, in particular a method of operating a computer, may be put into practice with the help of a computer program, a claim relating to such a method does not claim a computer program in the category of a computer program (point 5.1 of the reasons). 2. A computer-readable medium is a technical product and, thus, has technical character (point 5.3 of the reasons). Helping a user install GNU/Linux to resolve “crashing problems” would qualify for patent since it would “lead to a more reliable computer”. You can’t be granted a software patent if your algorithm leads to “less reliable computer”. That’s good news. So only malware writers won’t get patents to sue us with. a) The answer is of course “no”. It means: is it also excluded when it is not literally claimed as a “computer program” but as a “computer-implemented data processing apparatus”. Q1 is just for warmup. 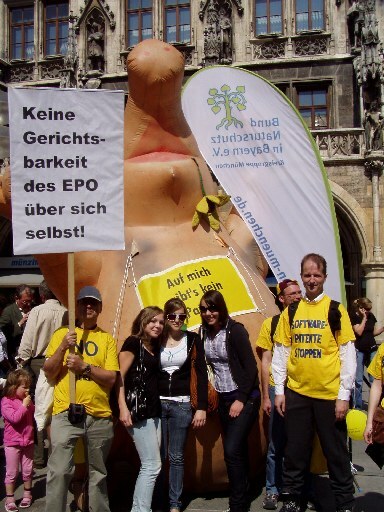 b) If you want to be considered you have to submit your comments via post to the Munich address and subject “G3/08″ as the EPO invented its own private law rules concerning reception. They just ask to submit electronic files for their own convenience concerning additional publication on their website. Thanks for the explanation. The EBoA has already sent me a confirmation of receipt.